Got questions about the OPOLAR Ceramic Space Heater? Well, we have got answers! Are you going on a camping trip soon? Before you head out, you want to make sure you will have everything you need. Perhaps one of the most important things you can pack along with your car camping tent is a portable heater. With the cooler months setting in, you will be glad you did. Today, we are going to take an in-depth look at one of the latest portable heaters from the OPOLAR brand. This is the OPOLAR Ceramic Space Heater. Not only are we going to go into the details of what makes the OPOLAR Ceramic Space Heater so awesome, but we will go beyond that. You will get the chance to hear what travelers who have purchased the OPOLAR Ceramic Space Heater have to say about it. And if you decide that it is not the best heater for you, then we will do you one better. We have listed three of our top favorite portable heaters that might work better for your travels instead. OPOLAR or not, stick around and we're sure to get you in the right direction as purchasing the best portable heater for your next adventure. Let's get started! When it comes to the appliances around your house, there are many brands that you can go with. While the power of choice is in your hands, there is one brand that you should not overlook. This up and coming company that is loved by travelers everywhere is the OPOLAR brand. OPOLAR offers a range of home improvement appliances that will make your life well, better. Although the company is still quite young, don’t let that dissuade you. This 2015 startup has grown to become a customer focused small appliance brand that offers unique and innovative home products. While there are a range of products that they offer, there are some that are more popular than others. Some of their most popular products include laptop fans, humidifiers, and personal cooling fans. OPOLAR is different from many mainstream brands when it comes to the design of their products. All of their products have a unique design that blends in seamlessly to any environment. Perhaps it is the design of their products alone that has propelled them to be loved by travelers and millenials alike. One such product that OPOLAR is very proud of is their personal space heater, the OPOLAR Ceramic Space Heater. If you love going outdoors and camping in tents, then this is one of the best space heaters to bring along with you. As far as space heaters go, the OPOLAR brand has been very promising with the innovation of the OPOLAR Ceramic Space Heater. Not only does it get the job done, but it has a fantastic overall design. Read on the get the nitty gritty detail of what this space heater has to offer. When you think of space heaters, images of bulky heaters with mesh cages that klink and clatter might be what pops into your head. When it comes to the OPOLAR Ceramic Space Heater, the opposite is quite true. Right off the bat, we love the look of the OPOLAR Ceramic Space Heater. It has an incredibly sleek design that makes it stand out in a line up of other space heaters. This is unsurprising. Considering the OPOLAR Brand, this falls right in line with what you would expect an OPOLAR product to look like. The OPOLAR Ceramic Space Heater is currently sold in two colors. You can buy the OPOLAR Ceramic Space Heater in a sleek black design, or a cool looking silver design. Whichever you settle on, they both look fantastic no matter where you use them. What we most love about the OPOLAR Ceramic Space Heater is the absolute attention to detail that was put into it. Although it is a sleek and simple design, you can tell that it was crafted with care. One of our favorite aspects of the design is in terms of the face. The front of the OPOLAR Ceramic Space Heater is a ceramic mesh that takes away the bulky look of traditional space heaters. Rather, it gives off an elegant yet modern look. We love that the OPOLAR Ceramic Space Heater was designed with safety in the forefront. There are several safety features that are not only great but will give you a piece of mind too. For starters, there is a neat "tip over protection" feature. The heater will shut off and cease to run if it gets tipped over. Not only that, but there is an awesome overheating protection feature as well. If the OPOLAR Ceramic Space Heater senses that it is getting too hot, then it will automatically shut off. All who come in contact with this heater will be able to use it with ease without any safety concerns. 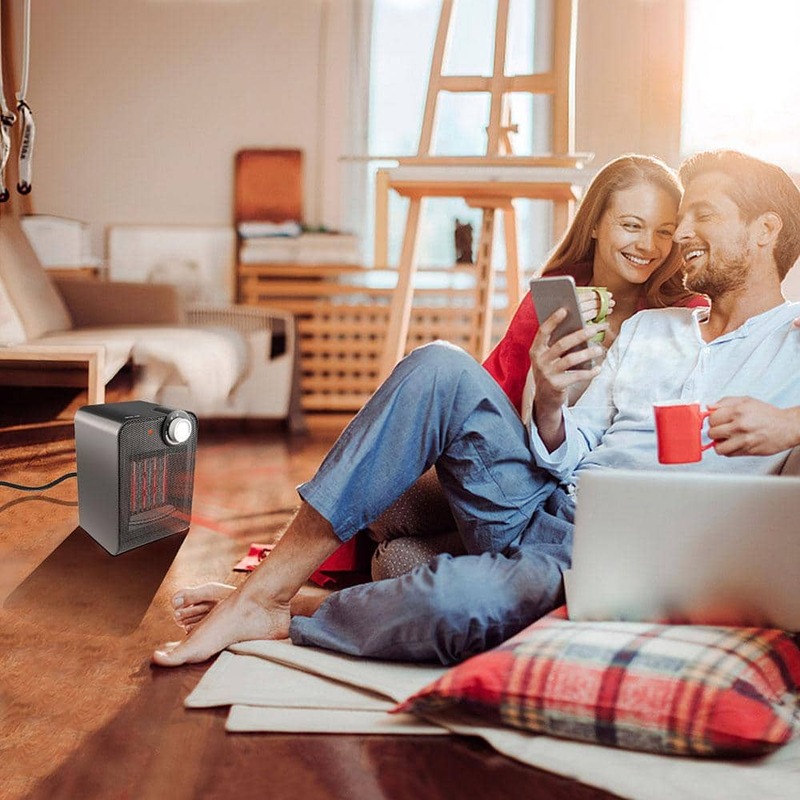 When it comes to the tech specifications of this portable space heater, we are pretty impressed with what it has to deliver. 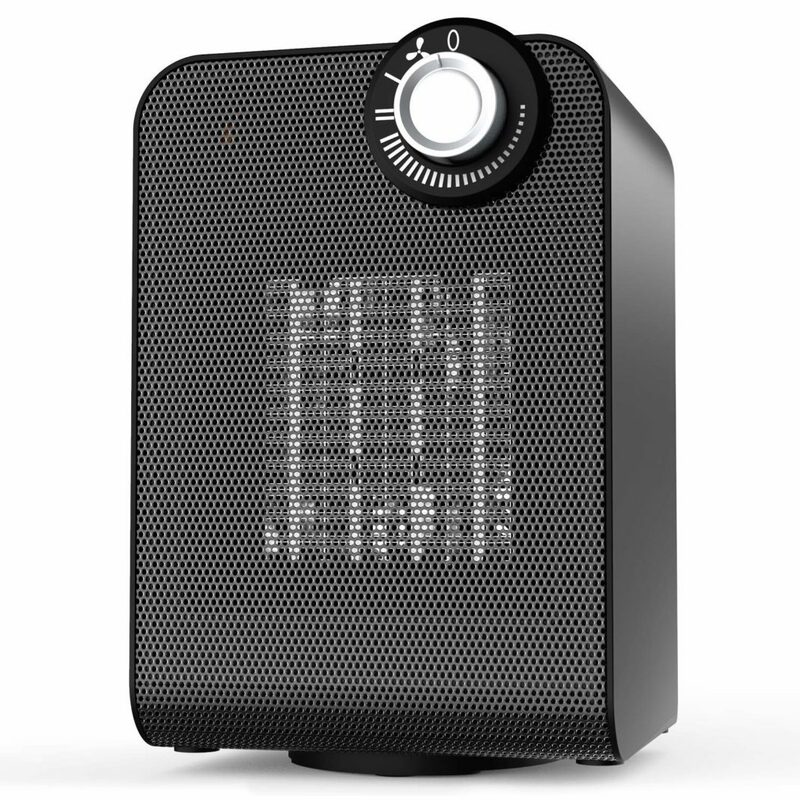 For starters, the OPOLAR Ceramic Space Heater comes with an adjustable thermostat. Many personal space heaters do not allow you to control the level of heat. However, we are pleased that the OPOLAR Ceramic Space Heater allows you to. The thermostat control is rather easy to use and anyone can do it. The different heating modes are super responsive, and they will heat the room at a different level in a matter of seconds. When you are adjusting the temperature, you do want to make sure that you are adjusting it in the right manner. You want to always be sure that you adjust going clockwise when you want to turn up the personal heater to the max power. Another feature of the tech specifications that you should consider is the power it provides. Once you turn it on, OPOLAR advertises that in a matter of 3 seconds, you will feel the heat. This is mainly due to the large amount of heat that is put out. The power that the OPOLAR Ceramic Space Heater has is 1000 watt or 1500 watt of propagating heat through the aluminum radiator. The ample amount of heat it gives off is great if you will be camping in cold areas or in tight spaces. Finally, we love that although this heater provides ample warmth, you would likely not know it. It is incredibly quiet and will not annoy you. You can work or sleep in comport and peace without having to worry that the OPOLAR Ceramic Space Heater will disturb you. With any personal heater, portability is an important feature to consider, especially if you will be hiking, camping, and doing a good bit of moving around. What we love about the OPOLAR Ceramic Space Heater is the fact that it is super portable. You can it around and place it in any location with ease. The only downside is the fact that it is not packable. This means that if you will do doing a lot of traveling, this heater will take up some space and you will not be able to easily pack it along. The price point of the OPOLAR Ceramic Space Heater is rather fair. The OPOLAR Ceramic Space Heater is currently priced at just under forty dollars. While this might sound a little overpriced for a personal space heater, it is actually not. The OPOLAR Ceramic Space Heater has some awesome safety features that make it a great pick if safety is a concern. However, the main selling point with this personal heater is the fact that it has such an excellent design. Whether you are using it outdoors or are looking for something to use at home while you plan your next vacation, this personal heater delivers. Travelers all over are incredibly pleased with the OPOLAR Ceramic Space Heater. For starters, many travelers love the overall design. Along with that, travelers are simply blown away by how powerful this little heater is. In a matter of seconds, you can begin to feel the heat that the OPOLAR Ceramic Space Heater gives off. While this heater has plenty to offer, there are still some issues that bother travelers. For example, if you will be packing up camp and moving around, it can be annoying to have to carry this heater with you. It does not really pack well, and although it is portable, you won't want to go on adventures with this stuffed in your bag. Another issue that customers have fault with is the noise level. Although the OPOLAR Ceramic Space Heater is advertised as being low noise, there are travelers who say otherwise. 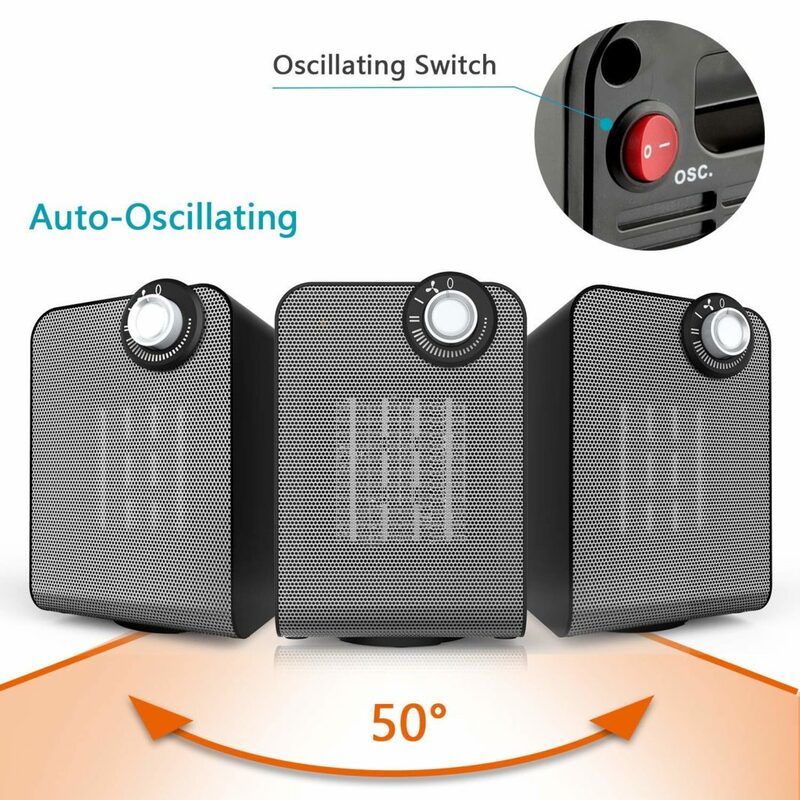 It should be noted that customers who have purchased this heater and who tend to use it in indoor spaces are more likely to be the ones who complain about the noise. Many travelers who use it for camping, tend to say that the noise blends in with the noise of nature and is not too annoying to have to deal with. If after all your research, you decide that this might not be the best heater for you, no worries. We have included a range of some of our other favorite personal heaters that you have to try out. Another great personal heater that is perfect to take with you on all your camping adventures is the Mr. Heater Little Buddy. What makes this portable heater system great is the fact that it is an indoor safe propane heater. Better yet, although it is a small heater, this bad boy provides ample heat for up to 95 square feet. Hikers and campers love that this personal heater provides continuous odor-free heat for up to five and a half hours. Not only does it provide great heat coverage, but the Little Buddy offers a 45-degree heating angle. If you hike at high elevations, then you can bring your Little Buddy along up to 7,000 feet. A major safety precaution that is great with this personal heater is that it has a low oxygen sensor on it. With that, comes an accidental tip-over switch with an auto shut off. This can be especially helpful for travelers who are nervous with personal heaters, to begin with. Finally, we love that this heater is super easy to use with no fuss. There is a quick on and off button that will get you feeling warm in no time. Oh, and did we mention that the Little Buddy weighs only one pound! Talk about light luggage. For travelers who are looking for a straightforward heater minus all the fuss, the Mr. Heater Little Buddy is a gem to have on hand. 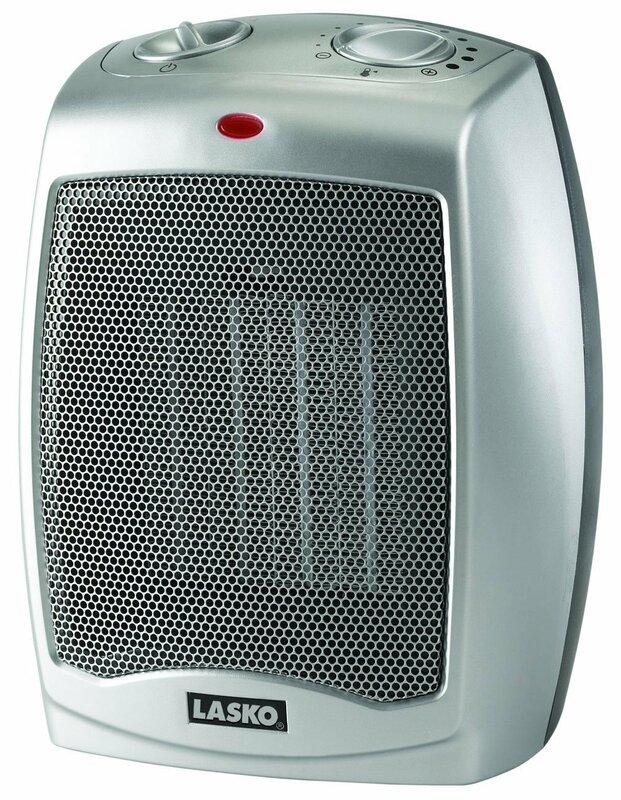 If you are looking for a durable heater, then the Lasko 754200 Ceramic Heater is a great option to go with. Overall, the features of this heater make it a great one to pack along an all your camping adventures. For starters, what we love about this ceramic heater is that you can use the adjustable thermostat so that you are never too hot or too cold. There are three settings for you to choose from. There is high heat, low heat, and a fan only option. 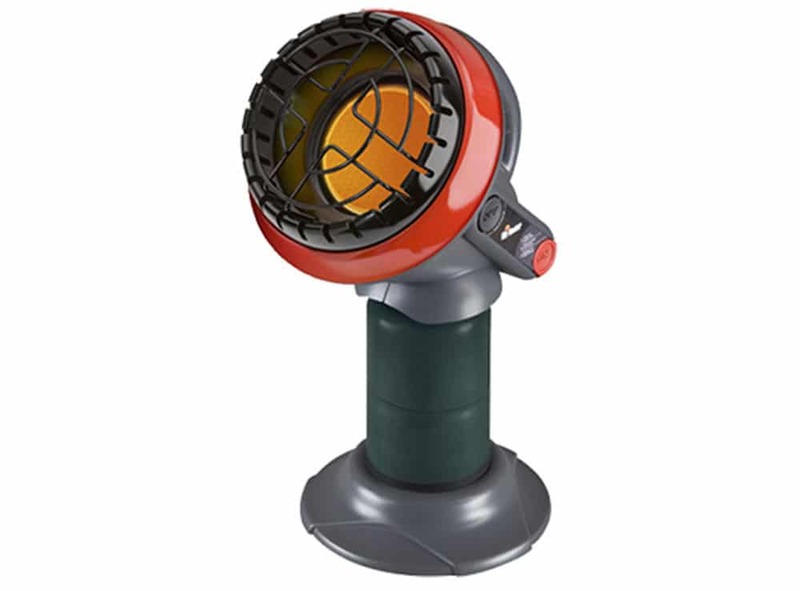 When it comes to the specifics, this portable heater features a 1500 watt high setting and a 900 watt low setting. This means that you customize its performance based on your need. Next, the Lasko offers an easy to use carrying handle. If you decided to move around on your campgrounds, you will be happy to know that you can relocate it with ease. This ceramic heater delivers in terms of safety as well. There is an automatic overheat protection built in. Although safety should not be a huge concern with this personal heater, you should use sound judgment when you are operating it. Last but not least, this is a great looking portable heater. Overall, this is just a great portable heater to bring along with you on your camping adventures. The Mr. Heater brand is known for making great quality camping heaters. 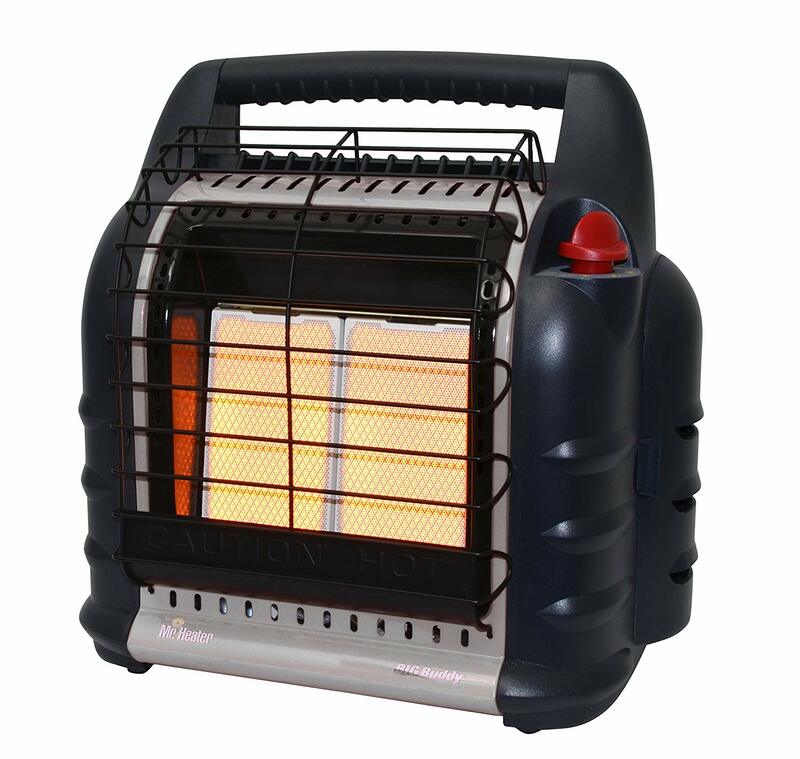 Another one of the best portable heaters to bring along on your travels is the Mr. Heater Big Buddy portable heater. If you are looking for durability and ruggedness, then this is the heater that you want to go with. If you are camping with a large group, then this heater is for you. This 4,000-18,000 BTU radiant heater easily warms up an area of 300 square foot. For a big boy heater, this portable heater carries several safety options too. For starters, it is approved for indoor as well as outdoor use. Not only that, but it is clean burning and nearly 100% efficient. If your heater is accidentally tipped over, then there is a neat auto shut feature that will kick in. This will allow you to rest easy knowing that you do not need to worry about your heater causing a fire. If you are traveling at higher altitudes like 7000ft above sea level, then you may experience your heater shutting off as well. Finally, we love that this heater does a great job adapting to your needs. 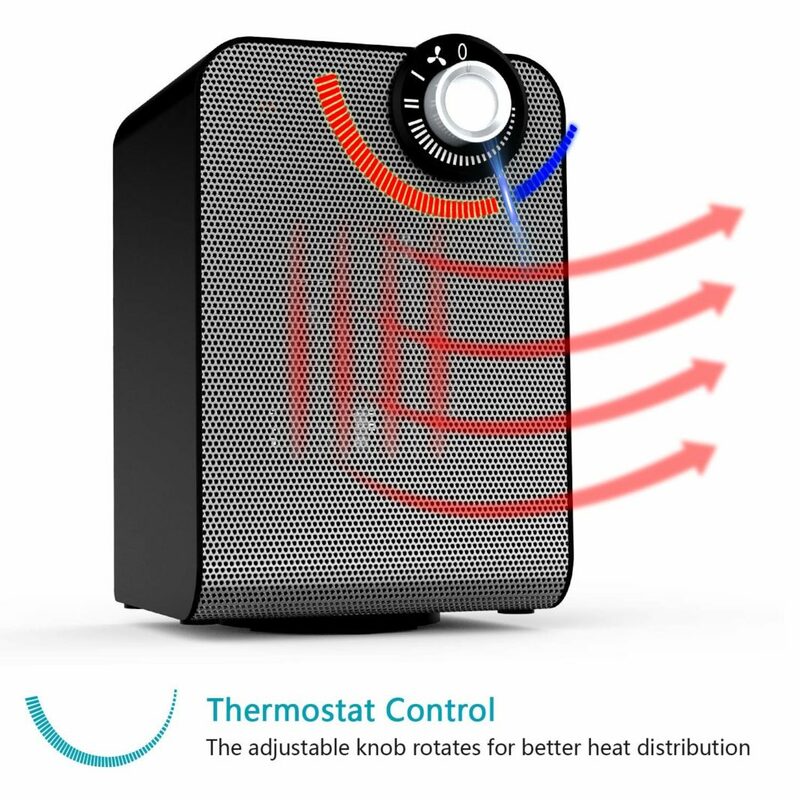 The Big Buddy offers you the ablility to ontrol the temperature. Choose from a low, medium, or high option for optimal comfort. Packing along the right camping gear can make or break an adventure. Having a portable heater to bring along is one of those things that you do not think about until you need it. Especially if you will be gong on any fall camping trips. So be sure not to leave it off your list the next time you go into the wild. Click below to get your hands on the OPOLAR Ceramic Space Heater today!